With next month being the 30th anniversary of the beginning of Formula 3000, the junior racing category that between the years 1985 and 2004 catapaulted many young drivers into Formula One, now seems to be an appropriate time to look back on the popular final step to F1. I’m going to focus on the late 1990’s period of the series, when the series was as exciting as F1. At it’s peak there were forty full season entries battling for twenty six spots on the grid. 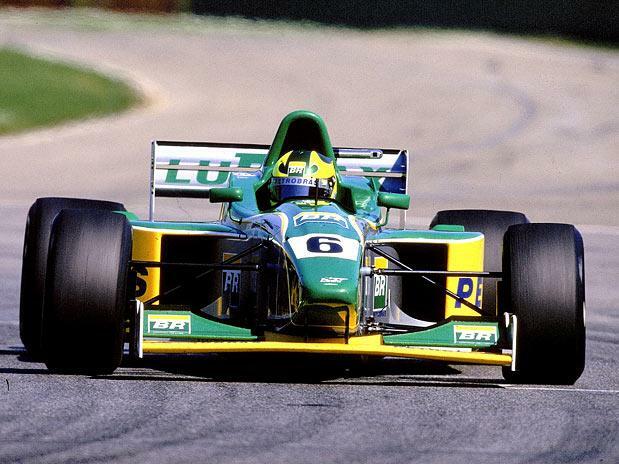 Despite have a spec Lola chassis and Zytek engine package, the series provided great racing during the late 1990’s, before rising costs ruined the championship by the early 2000’s. The series seemed to take on a new step during the 1996 season, where a new for 1996 spec Lola chassis and Zytek engine package produced a titanic title battle between the RSM Marko driver Jorg Muller and Super Nova racer Kenny Brack. A contentious collision at the final race of the year at Hockenheim settled the title in Muller’s favor, with the series showing itself to be a series on the up going into 1997. 1997 once again provided a title battle that went on until the business end of the season. Once again it was RSM Marko and Super Nova drivers who were fighting it out for the title, the only difference being the drivers involved as the Brazilian Ricardo Zonta turned the tables on RSM Marko to claim the title by 1.5 points from the Colombian Juan Pablo Montoya for RSM Marko. The series featured a talented crop of drivers as the likes of Jason Watt,Jamie Davies and Max Wilson established themselves as men to watch in their rookie years. 1997 would see the profile of the championship rise as the series gained mainstream television coverage from ITV,further enhancing the profile of the series for the future. For anyone also interested in this period of F3000 racing, EdwinTV9 has kindly posted the 1997 ITV season review on Youtube. The link is below, feel free to view it. 1998 was a stellar season for F3000, the last year of the Lola T96/50 chassis produced a thrilling title battle between Super Nova driver Juan Pablo Montoya and the young German Nick Heidfeld. The profile of the series continued upwards in 1998 as established F3000 teams such as Super Nova, DAMS and Astromega were joined by the likes of West Competition team and the RTL Team Oreca. These were big for the series as the West Competition team was a McLaren junior team to help Nick Heidfeld progress, with the RTL Team Oreca being a BMW junior team also. This showed the growing manufacture influence with the F3000 series. On the track Juan Pablo Montoya prevailed over Nick Heidfeld after a final round showdown, with the Williams test driver Montoya taking his talents to the highly competitive CART series in America, a title he duly won in 1999 before winning the prestigious Indy 500 in 2000 and returning to the F1 paddock with Williams in 2001. Of the rest Gonzalo Rodriguez impressed in his second year with two wins in the final three races, with Jason Watt once again showing his talents in 1998 for the Den Bla Avis team. Also individual videos reviewing the 1998 F3000 season can be found on Youtube. The coverage come from ITV highlights and the first round link can be found below. Feel free to watch. 1999 was arguably the most successful year for the F3000 series during it’s existence as the new Lola B99/50 chassis produced grids of close to forty cars fighting over twenty six grid spots. The 45 minute qualifying sessions suddenly became like races themselves as everyone fought to get into the main race. By now the series was supporting the F1 races the entire year with every race supporting a European F1 grand prix weekend. This link to the F1 paddock was now becoming far more obvious in F3000, with the West Competition team fielding Nick Heidfeld again as his dominated the year to comfortably win the title, with Gonzalo Rodriguez finishing third posthumenously in his Benetton backed Team Astromega entry, whilst Stephane Sarrazin impressed in his second year in the category for the Gauloises Formula Prost junior entry. 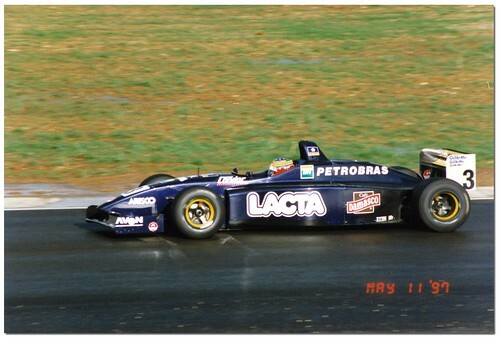 Other teams dipping from F1 into F3000 included Williams with their all Brazilian Petrobras junior team, Sauber with their Red Bull junior/RSM Marko team and the short lived Portman-Arrows team, which only survived three races despite Arrows F1 support. 1999 would prove to be a year of both tragedy and transition for the category, with firstly the tragic death of paddock favourite Gonzalo Rodriguez whilst qualifying for his second CART race for Team Penske at Laguna Seca. Soon after this second place driver Jason Watt was involved in a motorcycle accident during a magazine photo shoot, leaving him paralyzed and therefore ending his single seater racing ambitions. Along with Nick Heidfeld moving up to F1 for 2000, the series was looking for a new crop of talent to come to the fore in the upcoming 2000 season. 2000 was largely similar to 1999, the only major difference being a rule implemented before the start of the season to limit the grid to fifteen teams of two entries, meaning several of the smaller team were forced out of the series after poor 1999 seasons. This made the grid a lot more stable throughout the year, which was another classic season of F3000 as third year drivers Bruno Junqueira for the Williams affiliated Petrobras junior team and Benetton backed D2 Playlife Super Nova drivers Nicolas Minassian. Junqueira was the second half of the Williams shootout for a race drive in 2000, infamously losing out to Jenson Button before claiming the F3000 title. The series struggled to produce a crop of incoming talent to F1, as both Junqueira and Minassian taking their talents to Chip Ganassi Racing in the CART series for 2001. This seemed strange as the series F1 links grew stronger in 2000 with the European Arrows team being set up as a junior squad for the F1 team, with eight F1 test drivers racing in the category in 2000. Behind Junqueira and Minassian rookie’s Mark Webber and Fernando Alonso impressed, with Alonso joining Minardi for the 2001 F1 season, before Webber replaced him for the 2002 season. In retrospect it appears the 2000 season was a watershed moment for the F3000 series, with sadly the series having it’s final days in the sun in 2000 before the series began to implode as rising costs ruined the series. The series lost more back marker teams with the grid reducing from 30 to 26 cars for the 2001 season. The series incorporated a inaugural fly-away round to open the season, supporting the Brazilian Grand Prix. The F1 only grew even stronger this year with Minardi sponsoring the Coloni team to become European Minardi for 2001, although the grid did lose the McLaren junior team after a difficult 2000 season for the team. Coca-Cola also came on board sponsoring the Nordic racing team, showing the prestige the series held at this time. The Coca-Cola support of Nordic racing was timely as their driver Justin Wilson dominated the series to claim a comfortable title, beating Benetton backed Super Nova driver Mark Webber, team mate Tomas Enge and DAMS driver Sebastien Bourdais. The standard at the top of the grid was as good as ever, although the overall quality of the grid was slipping slightly from the landmark years of the series in the late 1990’s. Justin Wilson in action during his F3000 title year in 2001. He went on to impress when he could during a short F1 career after this. Photo credit goes to LAT.com sourced from AtlasF1.autosport.com . 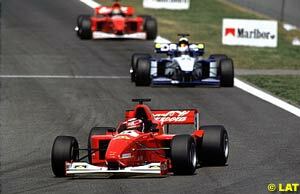 From here the series dwindled in both popularity and relevance to F1 during the next few years, with the only champion between 2002 and the series end in 2004 to get an F1 drive the following year was Tonio Luizzi, and he shared a half season drive with Red Bull Racing in 2005. 2002 champion Sebastien Bourdais took his talents to America, winning the Champ Car series four years in a row between 2004 and 2007, before impressing in flashes with Scuderia Toro Rosso in one and a half years of F1, before being dropped halfway through the 2009 season. 2003 champion Bjorn Wirdheim has never started a F1 grand prix, becoming a third driver for Jaguar racing in 2004, before switching to Champ Car and subsequently establishing himself in the Japanese Super Formula single seater and Super GT series over the last several years. F3000 was sadly replaced by GP2 for the 2005 season, something which was a shame but ultimately necessary as the F3000 series had simply run out of steam. The series was fantastic whilst it lasted, with it’s glory years surely making the series the most high profile junior category ever. We will likely never see again a grid full of forty cars competing to even qualify for an F1 supporting event, which simply shows the strength the F3000 series once had. It is a sorely missed final step on the ladder to F1. 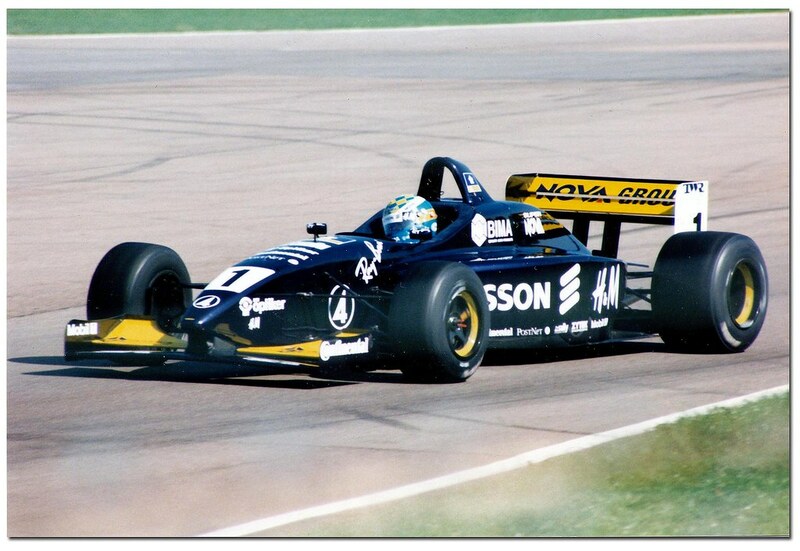 Any thoughts on this article feel free to post a comment good or bad on the F3000 series.